First, I removed the chrome edging from the lower grille and put it along the top edge to create more stability there. (It's barely visible only if you get down low enough). You will have to remove the skid plate screws along the bottom edge of the bumper and pull the plastic down to access the space behind the lower grille opening. I then applied a self-adhesive Zip-Tie Mount on the back side, inside lip of the grille opening and Zip-Tied the loose ends (toward the top) to the mount. This provides stability and rigidity at both ends and the chrome strip helps keep it flat across the length of the grill. Make sure you put back the plastic skid plate correctly when you're done! nice job with the pic and instructions! I dont have these grilles so it wouldnt help me. Didn't someone else on here do this also with the lay out? 06toyo chick wrote: ...Didn't someone else on here do this also with the lay out? Nice write up w/ pics Jeff. Thanks - and yes, it was someone else's idea originally - I just copied them and did my own thing with it, but I think my install technique is unique and thought I'd share it with anyone who wanted to do the same. Thanks again guys - had a few people standing around in front of my car when I came out of the restaurant tonight - one guy asked what kind of car it was - LOL - obviously didn't wander around the back! PXLpainter wrote: - one guy asked what kind of car it was - LOL - obviously didn't wander around the back! omg dont you love that! haha..the car is like a mystery to people.Someone I know couldnt believe it was a toyota, im like wow..should've told him a lexus or something lol.. and i bet he would've believed me! If the Lexus Logo would fit in place of the cowboy 'Yota logo you could defintiely have people going, that's for sure! I really think the interior fit and finish and overall build quality of the SLE is on par with the Lexus label IMO. ooo, I like! When the weather warms up . . .
PXLpainter wrote: Thanks again guys - had a few people standing around in front of my car when I came out of the restaurant tonight - one guy asked what kind of car it was - LOL - obviously didn't wander around the back! Yeah, the other day I caught someone using their cell phone to take a picture of my car while I was stopped at a light. Hey Jerry - speaking of pics - when are you gonna share some pics of that ride of yours with us? Hi, new to the board here. I own a 2007 Silver V6 Sport Coupe. The front bumper has always bothered me, I much prefer the 06 bumper. 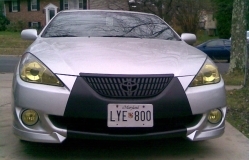 Anyway, does that honeycomb pattern for the lower grille match the OEM 07 pattern? I'm interested in installing one myself, how can I buy the lower grille? How much?